Beautiful day in the hills of Beaver Creek Colorado while on business. To tell you that my run was awesome is a total understatement. It was Majestic!! I talked to the concierge about running options. She told me that I could run down the hill and find the path along the river, then take the shuttle back up.. Hmmmm.. I knew I had a little over an hour to play with if I got up early enough. A paved trail with uninterrupted running for miles! 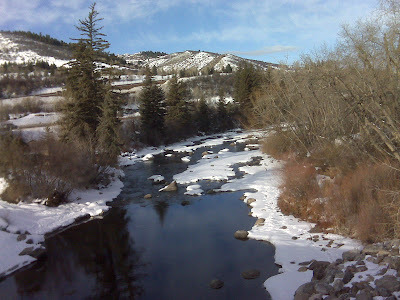 And it overlooked this river with snow and icicles, so pretty!! I was in Runner Heaven. New place to run, explore and see the land by the power of my size 10's. THIS IS WHY I RUN!!! Thanks to everyone for your support while I have been finding my way during this busy time in a new place. I know now that I can get in a long run and I am REALLY looking forward to it!! I am soooo sorry for being absent in commenting, but I barely have time or an Internet connection. Also Thanks for entering the Inperspire Giveaway!! PPS. My brain is toast so the "STU" alpha post will have to wait until next week..
wow, this run sounds and looks amazing! Definitely a great reason to run! I'm glad to hear you've been able to keep up with your running while in Colorado. I imagine it must help with any stress and other stuff you have going on - to clear your head! I think YOU deserve a 'high five' for your dedication this week! OMG must have been the best run ever!! I love running in new places! I just need to start traveling more! Soo pretty! You should have taken a pic of the treadmillers ;) Looks cold and amazing none the less!! If you do have time for High Five Friday - I have a giveaway going on at my blog for a sport's bra. What an awesome place to run! Great job on getting out there girly! Hope all is well! 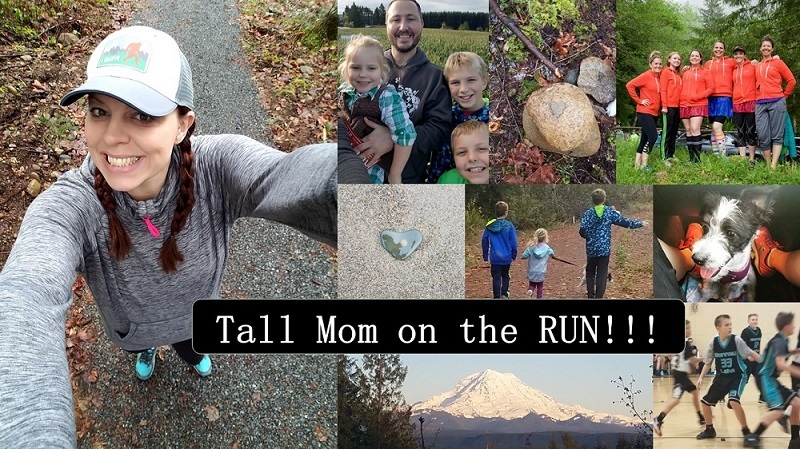 Awesome run... your photo and description make me want to run there! Love it! What a beautiful view! Thanks for sharing a bit of the scenery with us. Enjoy! Colorado can be a very cold place to run in the winter but it is just beautiful. I run in the cold weather here but I have a breaking point and I am always amazed to find people running in zero degree or colder weather! Glad you had a great run along the river, that trail - paved path sounds like heaven! running in a area that is visually pleasing is always nice! Great job! Happy Thursday, Mel! Sounds like you're getting to enjoy our fabulous country in Vail this week...have a great time! Yup - Beaver Creek is beautiful. Everywhere you turn is another gorgeous view. That's beautiful! I really don't get why people run on treadmills... UGH! Beautiful! I'm always amazed at peeps who can run in the snow and high altitude. You are rockin it! Colorado people are truly lucky. No wonder so many great trail runners live and train there. Enjoy it while you are there. It is so beautiful there. I am happy for you that you found your high altitude legs and lungs! Enjoy the rest of your time in the mountains! Gorgeous! Isn't it fun to have an adventure?! Enjoy the rest of the trip and see you when you get back! sounds gorgeous!!! wonder what the people are scared of?? (going outside)Thanks for taking the time to share and posting the pics!!! You mean you don't have time for us while you are working? Oh puhleeze. Just kidding. Nice job on fitting in some runs. Gorgeous pics. Sounds like an awesome place to run for sure!! I need some new spots. That sounds like a gorgeous run! Way to take on the altitude! It is gorgeous! Of course I am partial to snow and trees near rivers so it works for me! What a great way to see a new place. Glad you are finding outside trails. Exploring a new place by foot is the only way to go! Man, it is beautiful in Colorado. Congrats for getting the workouts in while traveling - it can be a challenge. That is why I wanted to move to Colorado. But nope. We're here. But that's okay. Great job on running while travelling! Wow, Colorado looks beautiful. I've never been but my parents went to Beaver Creek a long time ago and brought me home a sweatshirt :) I always think its so much more fun to exercise, especially walking or running outside in a new place! That looks/sounds awesome! Congrats on being able to experience such a great run.